References to wines and vineries in Toruń in the old chronicles might be considered a figment of imagination if not for numerous documents that confirm their existence. Vine growing in the area around Toruń was initiated by the Cistertians and the Teutonic Order in the 13th century. The latter planted the first vines on the Vistula escarpment in the right bank of the river, which was well wind protected and sunlit, as well as in the Mokre area. The wines they produced were so excellent that they were served at many neighbouring royal courts. 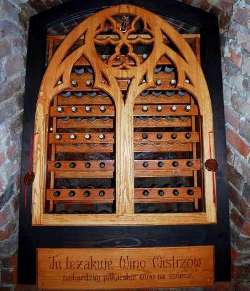 Toruń soon developed into an important wine trading centre, which was encouraged by an increased demand for liturgical wine, lively contacts between the Teutonic Order and other countries, and bringing German and Italian experts on vine growing to the Teutonic state. In the early 14th century the wines were used more for religious purposes rather than consumption. 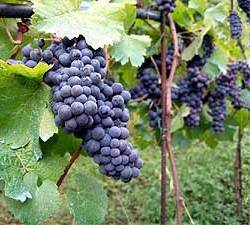 It was only in the second half of the century that a rapid development of viticulture occurred. Toruń wines were largely consumed by the Teutonic Knights, who used them alongside a number of fine wines they imported from abroad, which proved their quality. It was a common treat to the Kings of Poland during the receptions Toruń burghers organised to celebrate their visits. The oldest vineyards were located on the south-facing hillsides along the Vistula, between Treposz suburb and the New City of Toruń. In the 15th century the vineyards stretched as far as Kaszczorek (one of Toruń districts today). In 1425 the vineyard in Kaszczorek was bought by the Watzenrode family that was related to Nicolaus Copernicus. Upon the death of Lucas Watzenrode, the vineyard was inherited by Nicolaus Copernicus senior, his son-in-law and the father of the famous astronomer. Young Copernicus numerously enjoyed the vintage time there. Toruń engaged in large-scale grape cultivation. It has been established that the city collected tax from the vineyard owners and that there were around 25 taxed vineyards in the area around Toruń. The tax amount was huge which might indicate their considerable size. The end of the 17th century marked the decline of Toruń vineyards. They suffered extensive crop damage as a result of draughts and frosts and were largely destroyed by numerous wars that occurred, during which they were frequently burned, even by the very defenders. Toruń wine won remarkable recognition among the contemporaries, who considered it as one of the best. Today, however, its real quality is difficult to determine. Surely it tasted sour which does not necessarily prove it was bad. In fact, historical facts prove the contrary. this is true oil which makes my lips sticky". The Teutonic Knights consumed Toruń wine in large quantities, considering it the best in Pomerania. They also presented various celebrities with it, including Kings of Poland. In 1374 a Teutonic legate took 12 barrels to the English court. In 1402 the Great Master Konrad von Jungingen regaled King Ladislaus Jagiellon with the wine during his visit to Toruń castle for negotiations with the Teutonic Order. It might have been vintage 1362 or 1379, which for long passed as exceptionally delicious. On several occasions Toruń wines were sent to the Lithuanian court of Prince Świdrygiełło. The Teutonic Knights were hugely wine-lovers. They upgraded Toruń vineyards and brought in Rhine settlers who systematically improved the quality of wines produced in Toruń. Vine growing in Toruń was a largely profitable business in the Middle Ages. It involved the most popular patrician families such as the Watzenrodes. It was from Lucas Watzenrode that Nicolaus Copernicus’s father inherited the vineyards as his son-in-law. 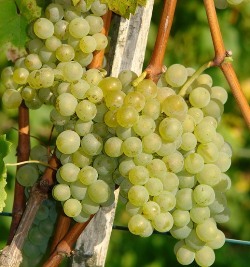 The vineyard was located in Kaszczorek and generated substantial income. 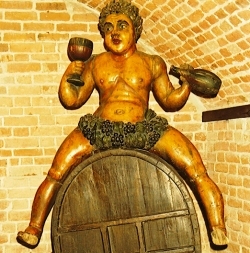 Toruń wine must have gained much recognition as – according to historical evidence – in 1374 a Teutonic legate brought 12 barrels to the English court and in 1402 King Ladislaus Jagiellon’s court had the opportunity to taste it in Toruń castle. In the Middle Ages the City Council established a separate office called a wine cellar which regulated wine trade organization and controlled its quality. Produced wine was stored in the city cellar and within 10 weeks its quality was tested by the city officials. Toruń vineyards survived until the end of the 17th century although as early as the 15th century Toruń wine making business gradually began to decline. The wars in 1410, 1421 and 1455 caused the greatest damage as most of the vineyards were destroyed at the time. The most football like wine in the world can be found in the Teutonic Castle in Toruń! On the 9th of December 2008 in the cellars of the Teutonic castle in Torun the ceremony of placing 69 "Champions Wine" bottles to aging process was held. 34 bottles will be under the aging process there until Polish team in football will gain either World or Europe championship for the first time in history. On the other hand, 35 bottles will be matured here till the time of capturing the title of world championship by this national foreign team to which the title has came up never before in history. After winning the world championship, each team player and each of three of its coaches will be able to personally receive the gift - precious bottle of wine waiting for him. 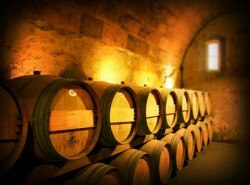 On the 24th of May 2009 in the cellars of the Teutonic castle in Toruń the barrel of 69 liters of "Formula 1 Champion Wine" was set to aging. The barrel will go to that Polish racing driver, who will be the first ever winner of Formula One Champion title. The wine stored there have been donated by the Italian F1 driver Jarno Trulli - owner of 35 hectares of Podere Castorano vineyard. "Thanks to "Wytwórnia Zdarzeń Niezwykłych" I Jarno Trulli giving you the barrel of the best wine from my wineyard - it is the gift for the polish formula 1 driver who is likely to win the Championship. 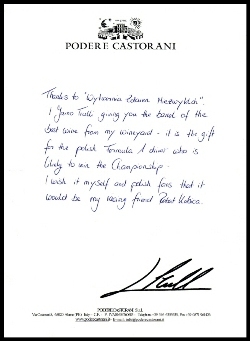 I wish it myself and polish fans that it would be my racing friend Robert Kubica" - wrote Jarno.